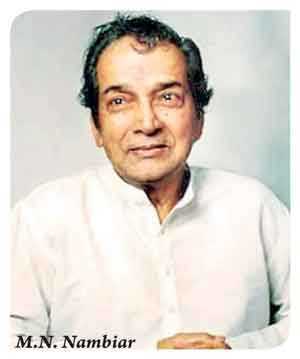 Thursday 7 March this year was the birth centenary of Indian film actor Manjeri Narayanan Nambiar known to the world at large as M.N. Nambiar. The great Thespian who made a name for himself by acting in negative roles was hailed by many as the greatest screen villain of Tamil cinema. In a spinoff from the iconic Western movie classic ‘The good, the bad and the ugly’ – featuring Clint Eastwood, Lee Van Cleef and Eli Wallach – the Nambiar book is named ‘Nambiarswamy: The Good, the Bad and the Holy’. As the title indicates the emphasis is on the spiritual dimension of the actor’s life. Nambiar was a great devotee of Sabarimalai Shree Aiyappan and undertook annual pilgrimages to the shrine for over 65 years. He was one of those instrumental in popularising the comparatively unknown deity over the years. Snehalatha known as Sneha. Dipak has been working on this book for many, many years while Nambiar was alive and has recorded many conversations with his maternal grandfather whom he calls “Appa” about various aspects of his life. He has followed it up by interviewing family members and film industry colleagues of his grandfather also. The book therefore is of two parts. One being a narrative of his life as told to his grandson by M.N. Nambiar himself while the other is an anthology of anecdotes and reminiscences about the great man. The icing on the cake is a foreword written by actress turned politician Jayalalithaa Jayaram, the former Chief Minister of Tamil Nadu. A special event was held at ITC Grand Chola Hotel in Chennai on 10 March to launch the book. A select audience comprising invitees were first treated to a film comprising scenes and stills from different films featuring Nambiar. This was followed by Nambiar’s daughter and Dipak’s mother Sneha Nambiar presenting copies of the book to some distinguished personalities. These included author Shreekumar Varma from the Travancore Royal family and great grandson of artist Raja Ravi Varma, Nawabzada Mohammed Asif Ali son of the Royal Arcot Nawab, former Tamil Nadu Chief Minister M. Karunanidhi’s daughter Selvi, Film Producer Daggubati Suresh Babu, Dr. Kamala Selvaraj (actor Gemini Ganesan’s daughter) Film Director P.Vasu, Actor-Director K. Bhagyaraj and actor S. Sathiyaraj. Thereafter speeches were made by Shreekumar Varma, P. Vasu, Sathiyaraj, Bhagyaraj, Kamala Selvaraj and actor-writer Mohan Raman who compered the event. Nambiar, then 16, played a comic role in the film. He along with actor T.K. Sambangi played a comedian duo inspired by the Laurel and Hardy duo of English films. Nambiar and Sambangi acted as the Akkannaa-Maadhannaa pair. He was paid Rs. 40 for his first screen role. The Film Director was Murugadas Swamigal. Out of this sum, Nambiar spent Rs. 20 and bought a harmonium which was retained at home until his death. The Jupiter films contract was the decisive turning point for Nambiar. It was his contract with Jupiter films followed by another with legendary film maker T. R. Sundaram of Modern Theatres that launched Nambiar’s entry into films in a big way. 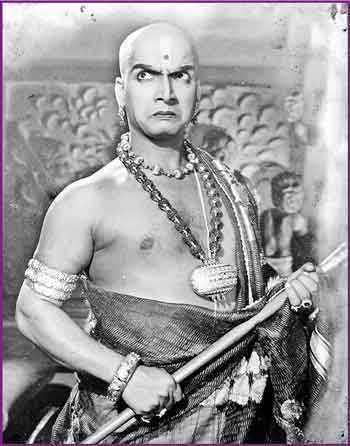 The story of M. N. Nambiar’s successful career as a film actor will be related in a forthcoming article.